The World Riichi Championship 2017 occurred October 4-8, 2017 in Las Vegas. There were 224 players in the tournament. The format was 9 preliminary hanchan after which the top 32 players would advance in elimination rounds. I was fortunate enough to participate in the event representing the USA and placed 50th overall. In this article, I’m going to write down random comments and anecdotes I remember from the event. (I’ve been putting this off for so long that it’s hard to remember). There was a social event the night before the tournament. It was fun dressing up and seeing all the players gather. Lots of faces I recognized and also got to meet some people I only knew from online. There were some speeches and then music by an Elvis impersonator while people played mahjong or danced. By some miracle of fate, I would be facing Moriyama in the first round again just as I had in the NYC International Riichi Open of 2015. Although I felt like I had improved a lot in 2 years, Moriyama still proved to be a formidable opponent as expected. Kakigi as well had a strong performance in this hanchan. Kakigi and Moriyama took 1st and 2nd at the table with me 3rd. One hand by Kakigi that I remember is a first row dealer riichi. I had no safe tiles against an early riichi and played a 9m. Unfortunately I dealt into riichi, pinfu, ittsuu for dealer mangan. Needless to say, it was difficult to recover. I don’t remember much else from the match besides going for toitoi a lot due to toitsuba (zero’s toitoi dash theory had recently come out too) and some desperate pushes against Moriyama’s dealer turn in S4 which continued for a few hands. I think I was a little nervous, and it didn’t help that I had a such a tough matchup in the first round. By this time, I felt more settled and performed better this match. I was quite excited to play Nikaido as she one of more famous female pros and I helped out with the scanlation project of her manga. Again it’s difficult to remember specific hands, but in general it felt like people called a lot especially for honitsu or toitoi. Once someone declared riichi and another player called pon 3 times after the riichi. The player in riichi then went on to deal into the open player for toitoi only. My reaction was just “…” Honestly that’s a play that I would never consider, but it happened to work out this time. I took 2nd place. I felt good about this match but a strong performance by Tokuda took him to 1st and left me in 2nd. I know Tokuda from a YouTube video where he got an incredible ryanpeikou sanbaiman, so it was quite cool to see him in person. He was also the first person I’ve ever seen who rolls the dice by bouncing them off the top of his wall. He’s probably no the only person to do this, but I found it a little quirky. During one of my dealer turns, I ronned Tokuda for dealer mangan (riichi, tanyao, pinfu, dora) while he was pursuing a chinitsu. However the next hand, he responded with a haneman tsumo causing me to lose extra as dealer. “Sasuga pro” is something I would be thinking a lot during this tournament. I should also mention that the German players were giving out snacks to all their opponents. It was a nice to receive German crackers to eat during the break. Danke! First, another German so more crackers! XD My hands this match were pretty mediocre and I took 3rd. Philipp Martin is a pretty big name in EMA, so it was pretty cool to see him in person. Hayama was the pro at the table for this round. It seemed like he had a rough game since he took 4th. Nevertheless he as a very jolly personality and made the table more lively. Starting with people I’m familiar with, there’s Jenn, whom I played before in the PML tournament, and Simon whom I know from FaceBook. I can’t remember much except maybe that Jenn looked a little intimidating with a face mask but I was glad to get a first. 2 pros again wow! Pretty average game for myself. Everyone at the table was quite pleasant and nice despite the obvious skill gap between the players. I still had fun. At this point (if not earlier), I was pretty much done. Near the end of tournaments you just go full yolo mode and push everything. I could have had a much higher score but I decided to push against a hell wait shousangen and dealt in lol. That’s probably the most memorable incident from that hanchan. There was a side event for those who didn’t make the top 32. It was tonpuusen with red fives, so quite a change of pace from WRC rules. Out of 182 participants (not all players were WRC players), I got 35th so I’m not disappointed. Again since it didn’t count for much, I just yolo’d and pushed hard. During the last game, the pro at my table had a problem with the way I build my wall. I build 2 rows of 17 and stack them but put the row farther from me on top of the row closer to me. He wanted me to do the opposite (put the row closer to me on top of the farther row) that way it’s a forwards rather than a backwards motion. I don’t really get it, but somehow it looks like cheating (tsubame gaeshi?) so now I just build my wall that way to avoid any potential complaints in the future. Thank you to the organizers, especially Gemma and David Bresnick, for the wonderful tournament. I am also honored to have been able to participate in the 2nd ever World Riichi Championship. Mahjong is a lifelong game, and I hope to keep playing for years to come and maybe in another WRC! Categories: IRL | Tags: mahjong, Reach Mahjong, riichi, riichi mahjong, WRC | Permalink. Today we return to Day 1’s topic with Double Riichi. The Basics: Double Riichi (両立直 / ダブルリーチ) or Daburii (ダブリー) for short is a yaku that is worth 2 han. 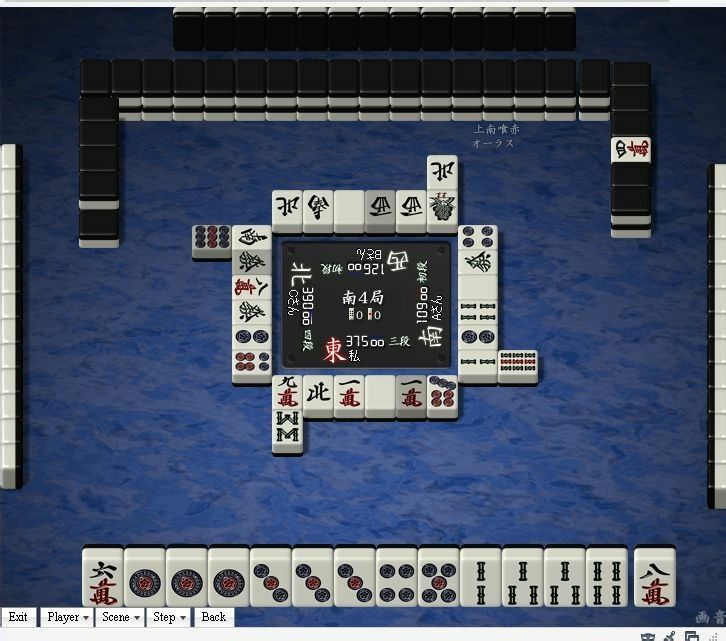 The same conditions as riichi apply to double riichi. The only difference is that a double riichi is made on the first turn. 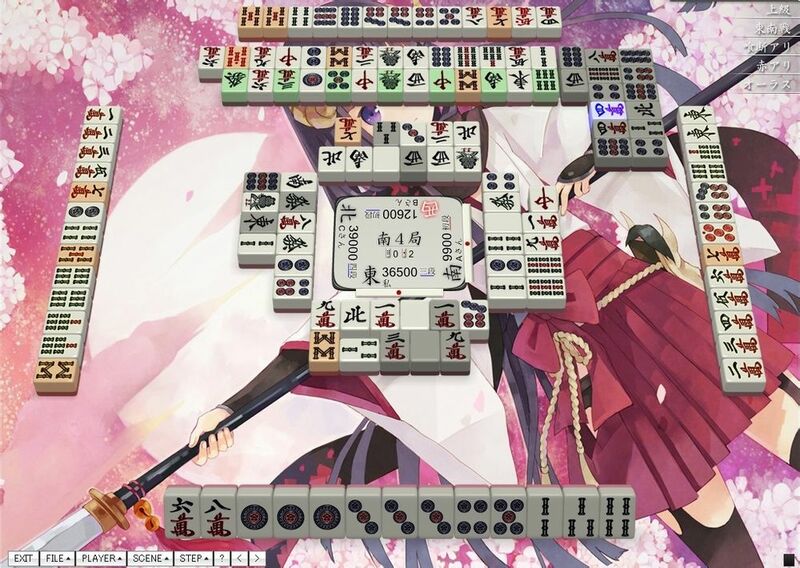 Thus a player must be dealt a hand already in tenpai. Like ippatsu, double riichi can be “cancelled” if a call is made on the first turn. However since that does not affect the player’s tenpai, the player may still riichi. In this case, 1 han from riichi will be counted instead of 2 han from double riichi. Thoughts: I don’t have much to say about double riichi. It’s really just luck based. If you are against a double riichi, it is a really tough situation. You have no information on safe tiles or how the hand developed. Sometimes things can go really badly like in this game. If you can make it past the first few discards, it may be possible to make a hand and win before the double riichi. In this way, double riichi is just like a normal riichi where you must decide whether to defend or attack. The benefit to defending is that you won’t deal in (if you defend well), but you are still vulnerable to a tsumo win. The benefit of attacking is it denies the other players the chance to win and gains you points. If you have no safe tiles, sometimes it can be argued that you should push because you have no other option. And thus we begin our look at the 2 han yaku. See you next time! 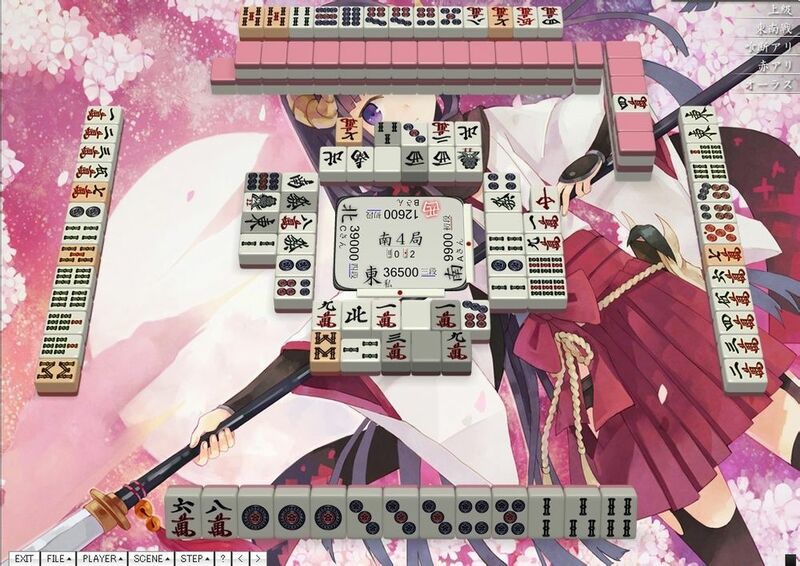 Categories: Theory | Tags: ダブルリーチ, double riichi, Japanese mahjong, mahjong, Reach Mahjong, riichi, riichi mahjong, yaku, 両立直 | Permalink.